Performers include: Priyanka Chopra, Jake McLaughlin, Aunjanue Ellis, Yasmine Al Masri, Johanna Braddy, Tate Ellington, Graham Rogers, Anabelle Acosta, and Josh Hopkins. This thriller series is set at the Federal Bureau of Investigations Virginia training academy, Quantico, and follows its newest young recruits. The best, brightest, and most vetted recruits are sent to what is essentially the country’s toughest boot camp and grad school rolled into one. They begin a grueling training regime that will push them beyond their limits both mentally and physically. All of the recruits have their own reason for joining. For Alex Parrish (Priyanka Chopra), protecting her country has always been her dream. Assistant Director Miranda Shaw (Aunjanue Ellis) and Special Agent Liam O’Connor (Josh Hopkins) are in charge of training. In one of the first exercises, they give the students 24 hours to figure out a missing part of one of their fellow pupils’ files. If they fail, they immediately go home. This enables them to dig into each other’s pasts, questioning, and suspecting all aspects of each other’s lives. Following the biggest terrorist attack on American soil since 9/11, an anonymous tip leads to Alex being suspected of the attack. With conspiracies and cover-ups at the heart of the agency she held so dear, she must go rogue in order to find out who is behind the attack and prove her innocence. Episode #57 — Who Are You? First aired: August 3, 2018. What do you think? 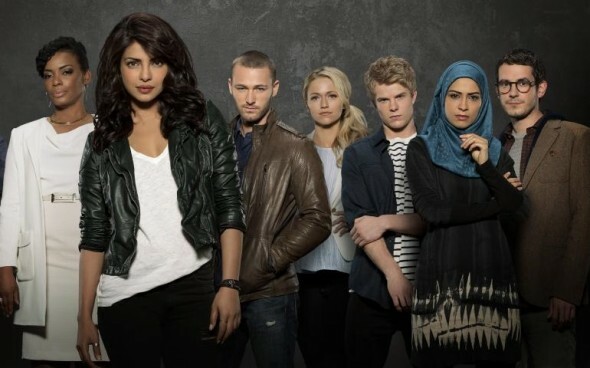 Do you like the Quantico TV show? Do you think it should have been cancelled or renewed for a fourth season? Quantico: Season Three; Should the ABC TV Series Be Cancelled or Renewed? I actually enjoyed the show very much. It’s to bad they cancelled it. I loved Quantico and I am heartbroken it has been cancelled. Horrible decision and a terrible ending. I binged watched this within a couple of weeks. I need to find out more. Don’t cancel, bring it back!! I can’t stop watching it. love it! don’t cancel! watched on Netflix. please keep it going! Please bring this show back! Seems like all the good shows get cancelled. Priyanka is kind of cute. Bad upper lip though. Why isn’t the black guy in your pic?????????????? Please bring the show back! The first season was great, the second a little boring but this third season was great and I think there was some cliff-hangers in it too. I think it should be renewed for one more season to see if they can do as good a job as the 1st and 3rd season. Priyanka is kind of cute. Bad upper lip though. Why isn’t the black guy in your pic???????????? ?